This is the wonderfully textured yet ethereal track “Supine Anchor” off the album Dual Concentric by Brooklyn-based Nature Program. Nature Program appears to be the recording moniker of the individual who made the HC-TT, a device I wrote about yesterday. 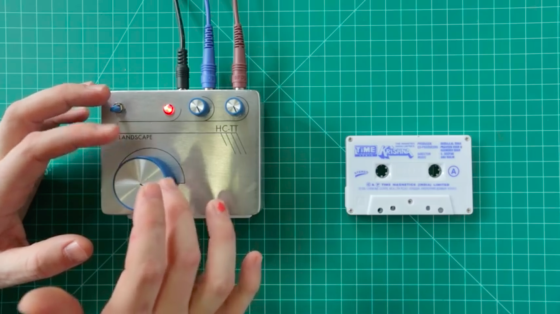 The HC-TT allows a musician to manipulate a standard tape cassette in real time, to edge the music forward and backward thanks to a large circular knob. This device was made for a fairly selfish reason: For years, I’ve wanted to have a compact, organized device that mirrors the compact, organized cassette medium. It’s an obsessive-compulsive dream to create your own library of tape loops which stay safely packaged and organized inside individual cassettes. “Supine Anchor” is among the most relaxed of the tracks on Dual Concentric. It is a sequence of layered loops whose texture and warped quality suggest they originated on physical tape, perhaps even involved the HC-TT in their production. There’s a lush voice, a falsetto, that brings to mind Brian Eno’s, and it appears about midway through the piece, after the initial bout of fractured minimalist abstract beatcraft melts into something ever more echoing and lush. There’s a lot more to the record than “Supine Anchor” might suggest: techno, light gamecore, electro, instrumental proto-hip-hop. But within that expansive coverage, 20 tracks in all, are about a half dozen or so with a more ambient quality to them. It’s unfortunate that Bandcamp doesn’t have a playlist function. Unlike services from Spotify to SoundCloud, Bandcamp lacks the ability for listeners to serve as collators. You can learn a lot from following and looking into the acquisitions of fellow Bandcamp users, but you can’t do much more than that. You speak through your wallet (and your wishlist) on Bandcamp. If you buy something, it’s associated with your account (mine is at bandcamp.com/disquiet), but you can’t, for example, create an ersatz hits collection for an artist with multiple albums, or, as I was drawn to do with Dual Concentric, whittle 20 tracks down to their background-music essentials. The full album is available at tonewheel.bandcamp.com. More on the HC-TT at hc-tt.com. Thank you for the playmoss tip! Try listen to albums like it was … Instead of chasing mindless playlists as background muzak.